Power Grid is an electrifying game to play. This game has been around for a while but proves to be an exciting and challenging game. The player who supplies the most cities with power wins the game. Sounds easy but there is more to it then just that. Read through the game rules and instructions below for the complete how to play guide. Power Grid is great for the moderate tabletop gamer that is looking for a challenge that won't take all night to play. There is a fair amount of strategy in this board game but like almost all games, there is a fair amount of luck as well. Give Power Grid a try today. The player who supplies the most cities with power wins the game. Inside the box you'll see 1 two-sided board, 132 wooden houses, 84 wooden resource tokens, money, 6 summary cards, 43 power plant cards, 1 "Step 3" card and the official Power Grid game rules and instructions. 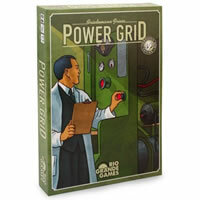 Please keep in mind that the official Power Grid board game rules and instructions could be different depending on the game version you have. The rules below are some of the exact directions on how to play Power Grid. Share with us your comments, funny stories, tips, advice, strategies, creative ways to play, questions about how to play, problems with the rules or anything you want about Power Grid. All submissions will be reviewed within 24 hours. Click here to add your Power Grid comments.